That’s the day America is waiting for. That’s the day that it is on! August 6 in Cleveland, Ohio: Trumpamania gets real. 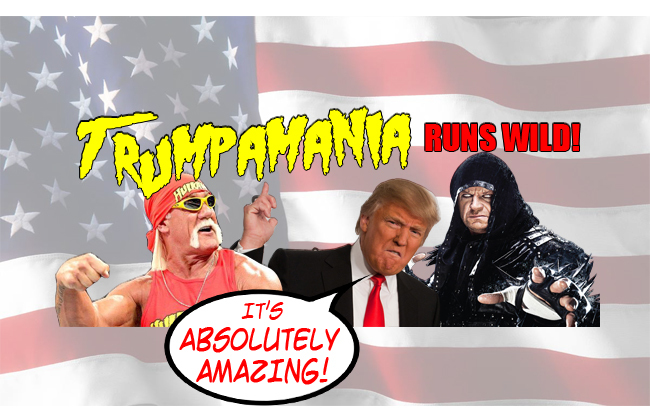 Whatever it is, this Trumpamania thing is getting serious. Seriously funny, seriously sad, and seriously bizarre all at the same time. While I don’t mean to force Scripture inappropriately, I can’t help but see God’s derisive laughter on display here in the form of Trumpamania(!). Before we get any further here, let me be clear that though I believe that The Trumpinator can win both the Republican nomination and the general election (yes, really), I’m not necessarily saying that I believe he will do either. We’ll talk more about that in future posts, perhaps. What I am convinced of is The Donald’s value as a gauge and indicator as to the true character of the Pagan “conservative” Right and the comically desperate extremes to which it will plunge in order to “make America great again” apart from humble repentance and submission to Christ as King in practice. Apparently, we’d rather have the “leadership” of The Donald than the lordship of The Lord. That’s what will “make America great again” to many on the Pagan “conservative” Right. And that’s what’s known in deep theological terms as “a big problem”. What do we do today, tomorrow, and every other day between now and Trumpamania(!) on August 6? Pray for leaders who will follow Christ in all things and inspire others to do the same, politically, economically, and in every other area of life. NextHow’s that Pagan “conservatism” workin’ out for ya, Christian?